Many shin hanga collectors feel that Doi seals pose some challenges and risks, particularly for prints by the popular artists Kawase Hasui and Tsuchiya Koitsu. There have been few solid guidelines for determining the age of a Doi print based primarily on its seals. 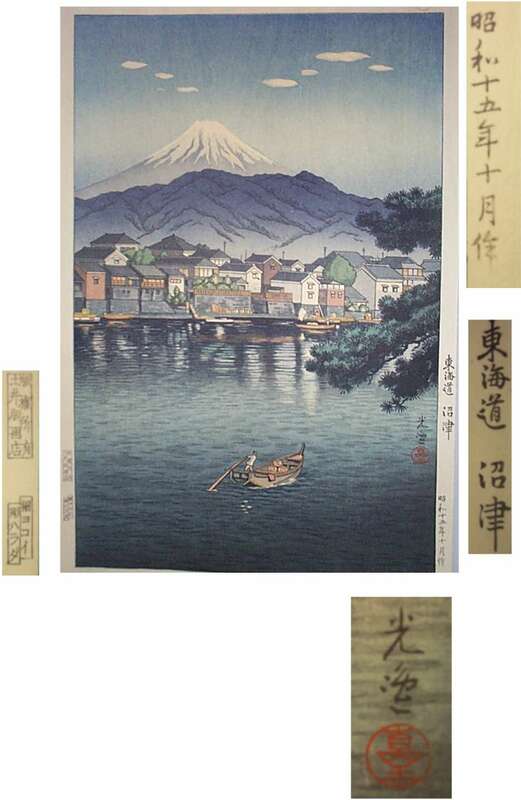 While many collectors use the Pachter date ranges for Watanabe seals on Hasui prints, there has been no comparable Doi reference tool in widespread use. Adding to the uncertainty is a perception that Doi management may not have followed the somewhat more uniform practices which were apparently used by Watanabe. For example, were Doi printer seals re-applied by other printers? Were Doi blocks re-used with new carver seals? Were Doi's prewar seals used again in the 1950's? In the 1990's? First, a word about the names. Merritt & Yamada explain that the founder Doi Teiichi passed the business on to his son, Doi Eiichi. Merritt and others give Doi Sadaichi as an alternate translation for the father's name, but for more background it's essential to read Dr. Grund's description of Koitsu and the Doi publishing house. Read the right column first, top to bottom: Hanken shoyu (copyright owned by). Note the single-stroke character in the lower left corner, the character ichi, or number one.  On prints which otherwise can be dated as prewar and early editions, these kind of ichi seals often appear. Although one would generally expect to see Doi Teiichi (the father's name) on prints with earlier dates, and Doi Eiichi (the son's name) on prints dated later, this is not universally true. Interviews have confirmed that the "correctness" of the current publisher's name was not necessarily the predominant factor when choosing a print's seals. Note: as mentioned above, Sadaichi is a technically valid but apparently incorrect interpretation of the name Teiichi. For these four examples, the right column contains the same hanken shoyu copyright characters. Hanga-ten means "picture shop", or print seller. Also note that these 'publisher seals' were generally not standalone seals, used independently. Rather, they form only the upper portion of a physical block or insert, called the koma, of which the lower portion contained the carver and printer seals (see below). These physical inserts were single carved elements used in their entirety -- even if a name on one or more of the component seals was no longer applicable. Here is a similar but smaller Doi seal from an early Koitsu kacho-e nature print. The seal reads han-moto Doi, where the term han-moto indicates a traditional woodblock print publisher. This seal shows the do character inside the i character, for the combination Doi. 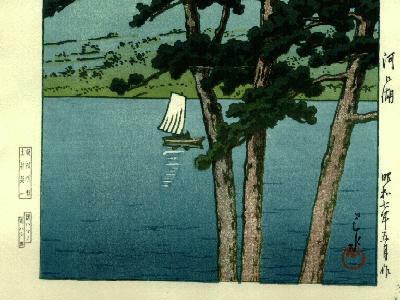 It's often found on small postcard-size prints, and typically located in the lower corner of the image. A number of "Doi" prints were issued by other publishers. You can visit a separate article for a summary of these Doi affiliates and their seals. Merritt's example shows the carver seal on the right, and thus primary. But so far the examples taken from Doi prints (see below) mostly have the printer seal in the first position. Here's one way to remember the carver seal: imagine that the three strokes at the right side of the top character represent the sharp knife-strokes of the wood carver. Then the other seal is the printer seal; it's been whimsically described as a man applying sheets of paper to a block of wood. The names here are given as carver-printer, and are listed in alphabetical order this way. Also see the separate page for Doi printers. This seal comes from the Doi print "Ryogoku Bashi", a 1936 print from the French artist Noël Nouët. See related article. This carver, Endo Kokyoku, is not listed in Merritt & Yamada. 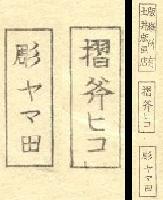 Note the Doi Eiichi publisher seal is a little different from the example shown above. More interesting is the discovery of another print with a "Doi Eiichi/Endo/Ito" seal. This koma looks different than the same combination immediately above, despite being also from a postwar reprint of a prewar (1936) image. Click here for one person's explanation why we don't see the same seal on both reprints. Of the four 'carver Endo' seals shown in this section, this one is unique on two counts. It's the only set with Doi Teiichi as publisher, and the only one giving Endo the primary position (to the right side of the printer). This carver-printer seal pair also happens to be the example illustrated in Merritt & Yamada, and depicted above. This image was provided to us courtesy of Mr. Sakai of Sakai-Kokudo Gallery, Tokyo. 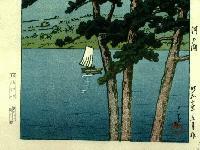 It appears on a Hasui print (first color version) Edogawa no Yuki, "Snow at Edo River". These seals come from a very recent reprint of a 1934 Koitsu night scene [small] [medium] [large] not often found on the market. See separate article. The printer seal gives the name Matsuzaki, also not commonly seen. The upper rectangle is the Doi Eiichi publisher seal. These seals come from a postwar print by Noël Nouët. The upper rectangle is the Doi Eiichi publisher seal. These unusual Doi seals come from the 1931 Hasui print "Toyomagahara Winter Moon" [small] [large]. The upper rectangle contains the standard copyright statement -- it reads hanken shoyu Doi Teiichi. The contributor reports "it's kind of odd, that the same character is used here with apparently different pronunciation [ to and fuji ]. Also, I've never heard of the carver Fujikawa as a Doi employee. 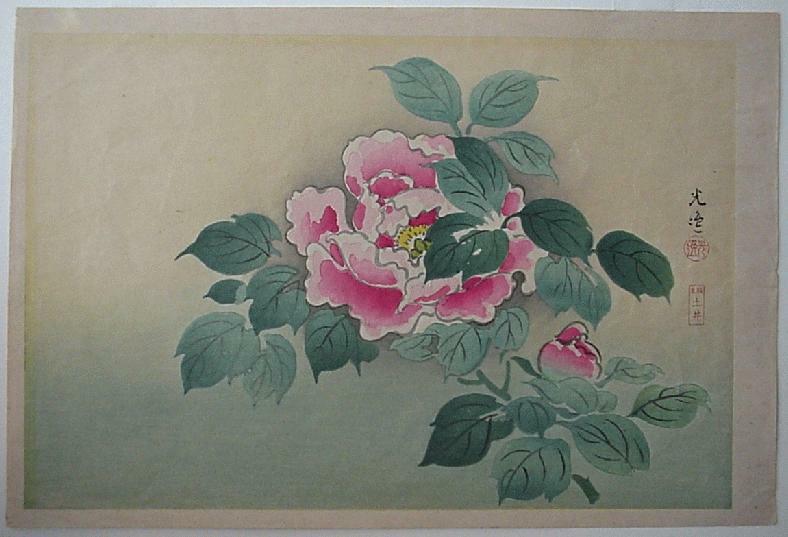 There is a Fujikawa Saburo who carved for Watanabe listed in Merritt/Yamada." Print D-1 of Narazaki's Hasui book appears to bear this Doi seal arrangement. The seals on print D-2 look the same too, but perhaps with double-wide printer/carver seals. The Hasui print "Toyomagahara Winter Moon" was carved by Fujikawa, as noted immediately above. A later edition printed by Ito probably dates from 1946 to the early 1950's based on the "in-line" Doi seal arrangement. For this printing a completely new koma seal was made, using Katakana rather than Kanji letters for the name Fujikawa (at left, bottom). These seals are from a later state of a Hasui print "Kawaguchi Ko" [small] [medium] [large]. The publisher stamp is Doi Eiichi, carver Harada and printer Hamano, which means it is a posthumous print made in the 1990's by Hamano. (Harada passed away many years ago.) See the separate case study for this print. For the carver seal, note the treatment of the last syllable da. One often sees Harada seals which use the Katakana character for da, while these two examples use the Kanji character. To see a third example, click here. 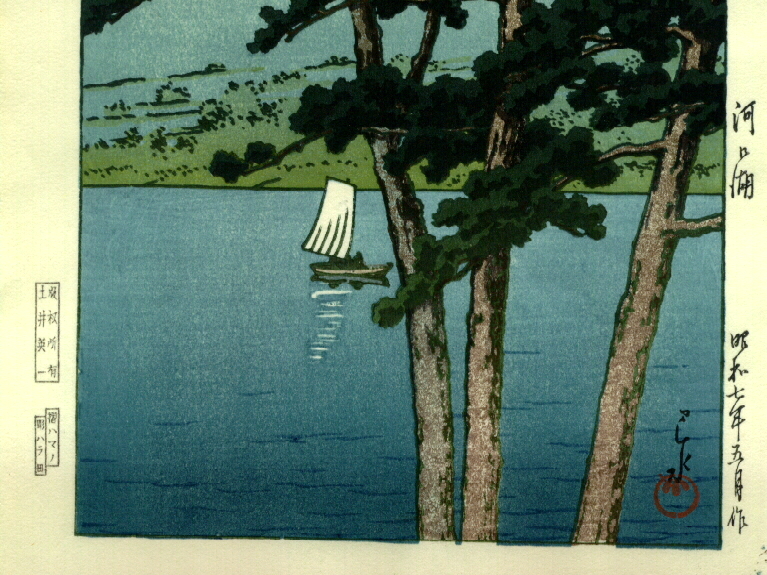 This is from a 1932 Hasui print "Spring Rain at Arakawa". 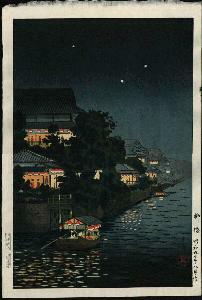 Another copy of this print has been seen bearing the seals of Harada-Yokoi. 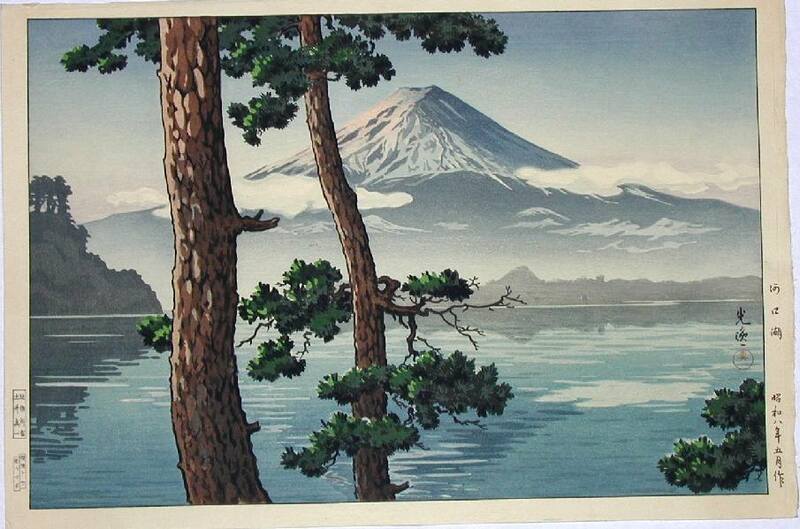 From a Hasui print "Mt. 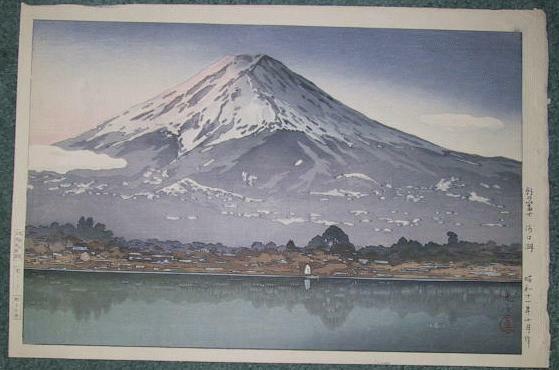 Fuji After Snow", dated January 1932. Note the Kanji da syllable in Harada's name. 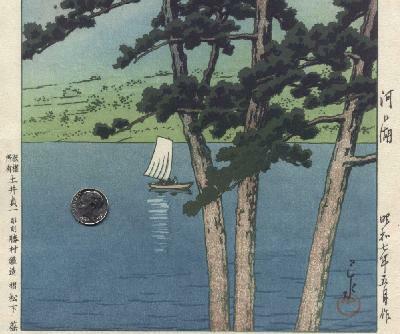 The Hasui print "Spring Moon at Ninomiya Beach" has also been found with this seal. This print is dated March 1932. Our contributor reports that this seal was used for later Hasui editions. 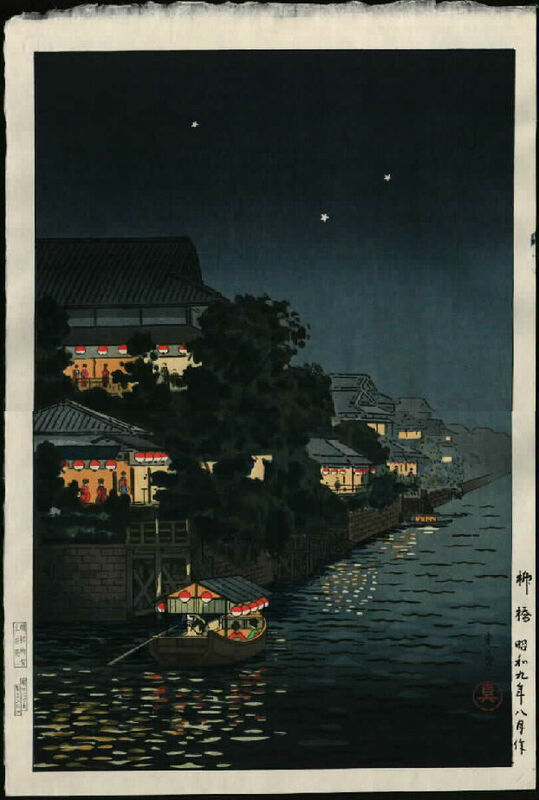 This copy came from Hasui's "Evening at Itako". Our first copy of this seal came from the Koitsu print "Snowy Miyajima", also mentioned below under Ikeda-Yokoi. This is another example of multiple carvers getting credit for apparently the same blocks. Note again the Kanji da in Harada. Our contributor reports that this seems to be a common seal combination. These seals are from a Koitsu print titled "Numazu" from the series "Tokaido". Its date is Showa 15, 10th month, or October 1940. 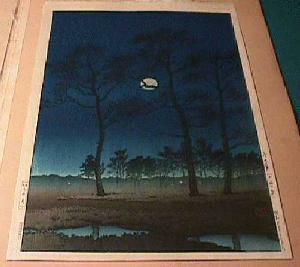 It thus seems to be an an early edition, carved by Harada and printed by Yokoi. The publisher seal reads Doi Hangaten. These embossed seals appear on a chuban-sized kacho-e Koitsu print, entitled "Peacock" (not dated). In the large image of the print, the embossed seals can just be faintly seen in the lower left margin. This is a rarely-seen seal, found here on a Koitsu print "Great Lantern at Asakusa Temple". The print is dated 1934 in the right margin. At the left side is the carver seal IKE DA; this could be one of Ikeda brothers who were active carvers around the time this print is dated. At the right side is ICHI KAWA, a printer's name not recorded in Merritt & Yamada or other references. Both names are written in Kanji. This vertical stacking is relatively uncommon, and is believed to sometimes indicate an early printing. See a similar configuration at Harada-Ito #2 above. From the top down, the seals are: Doi Hangaten, printer Ito, carver Ikeda (last syllable da in Kanji). These are from a Koitsu print of Mt. Fuji behind Lake Kawaguchi. It is dated Showa 11.1 (January 1936), and is reported to have been acquired in Japan in the late 1940's. This seal appears on several Koitsu chuban prints, including one of Miyajima Shrine and one of Godaido Shrine at Matsushima. Notice the use of Kanji characters, making the Ikeda seal different than the one below. This is another seal from the Koitsu print "Snowy Miyajima". As noted above under Harada-Seki, this is an example of multiple carvers getting credit for apparently the same blocks. Both printer and carver names are given here in Katakana characters. These seals are from a Koitsu print "Ueno Kiyomizu Do". Note that only the last syllable for Yokoi is in Kanji. 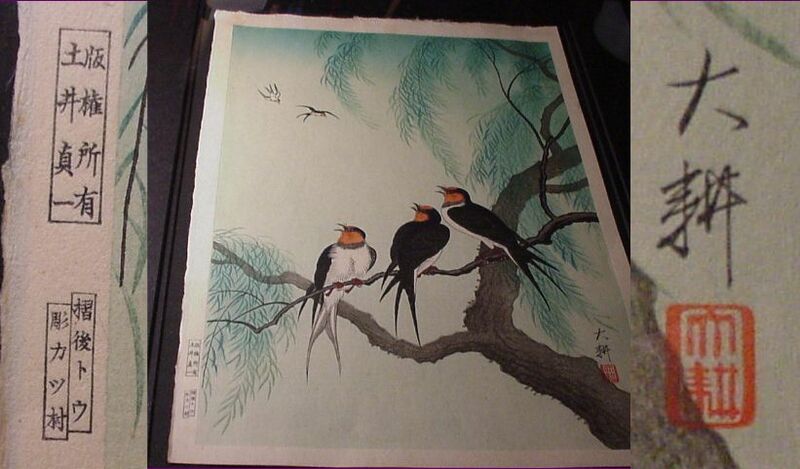 This is from a shin hanga bird print by the little-known artist "Daiko". Philip Roach places this print as circa early 1930's. Katsumura was "one of the most highly respected carvers of Taisho and prewar Showa times, said to have been able to split one hair into three pieces. Katsumura's carving was so precise that publishers sometimes complained that his pictures were too pretty and consequently lacking in taste." -- Merritt 1990. This combination has been seen on two Doi prints , which both carry 12 mm round watermarks. This combination was found on "Spring Rain at Gokokuji Temple" by Hasui, 1932 (N #D-13). This print has an unusual watermark of DO-I in two vertical Kanji characters with 20 mm square size each, at the left middle of the oban sheet. Note that the printer's name Ikeda Tamotsu should not be confused with the carver Ikeda, who appears several times above. An image is unfortunately not available now, to allow comparing any similarities to the combination shown below: Katsumura Shozo and Matsushita Tamotsu. This seal is from the Hasui print "Kawaguchi Ko" [small] [medium] [large], mentioned above under Harada-Hamano and the subject of its own case study. This printing is believed to be a very early state. The top four characters are the copyright statement hanken shoyu. The next characters read "Doi Teiichi". Next comes the carver symbol (remember the knife cuts), followed by Katsumura Shozo, in Kanji characters. Here we see the first instance of a carver's name coming before the printer's. Last comes the printer symbol and the name Matsushita Tamotsu, also in Kanji characters. Most of the Doi prints in Narazaki's Hasui book appear to bear this seal arrangement. It can be seen on prints D-3, D-6, and D-8 through D-13. The seal to the left comes from a 1933 Koitsu print "Kawaguchi Ko" [small] [medium], not to be confused with the Hasui print mentioned directly above for Katsumura-Matsushita. The seal to the right is found in the catalog Fuko Raisan: Tsuchiya Koitsu Ten, plate 7 ("Benkei Bridge", 1933). It's interesting to note that the upper Doi Teiichi seals are clearly not the same in both sets. The printer and carver seals look about the same, which raises a question about the triple-seal koma construction -- is it always one piece? 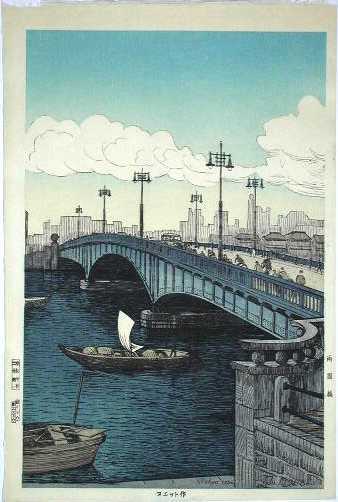 The 1933 "Benkei Bridge" print also bears the stamp Tokyo Fukei (Views of Tokyo), along with 6 other prints dated through 1935. One sharp member has pointed out that this suggests a "series" reprint date of 1935 or later. Namely, if some or all of these prints did not originally carry the Tokyo Fukei stamp, these images were later designated as a series. The series bears carver-printer seals from Katsumura-Goto, Yamada-Goto, Katsumura-Matsushita, Ikeda-Yamada, and Ikeda-Goto. These seals are from a Koitsu print "Niijo Castle". This vertical set of three seals appears on the popular Koitsu print "Benkei Bridge". The carver seal (close-up, left side) reads Yamada, with the last character da in Kanji as has been done with a number of seals noted above. The printer seal (close-up, middle) reads Ono in Kanji and Hi-ko in Katakana. See the listing of Doi printers. The shin hanga scholar Philip H. Roach, Jr. reports the names of other Doi personnel not mentioned above. 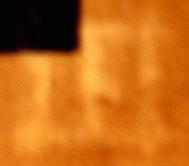 His full list of carvers includes Shozo Katsumura, Endo, Harada, Ikeda, Yamada, Ito, and Kataoka. He lists as printers Yokoi, Ito, Tamotsu Matsushita, Goto, Seki, Hamana, Sato, and Yamada. See the separate Doi printers page for some additional information. If you have images of seals not shown here, please send them in. One notable family is not recorded above, since they may not have worked for Doi. "Several generations of the Okura Hanbei family carried on the block carver tradition through the late Meiji, Taisho and Showa periods. Okura Hanbei II died in 1925. His descendant, Okura Kenji, known as Okura Hanbei IV, has been carving since 1937 and is still prospering at the family profession and training apprentices at the present writing. Okura Hanbei IV has worked for most of the publishers mentioned above including Adachi, Watanabe, Unsodo, Kyoto Hangain, and Kato Junji." -- Merritt 1990. Many early Doi prints have a watermark in the paper, often in the upper left corner. But this by itself is inconclusive. Later prints can also bear watermarks, and there are early Doi prints which lack watermarks. On early Doi prints, one commonly expects a joint appearance of seals and watermark together. But again, there are early prints with seals and no watermark, prints with watermark and no seals, and certainly later prints with seals and watermark. The sizes listed above are measured from the outside edge of the thick border. When measuring, try to use the center of each line on the ruler. Shifting to a thinner line helps too. On some rulers the major markings are about 1/2 mm thick, which can make it hard to measure consistently and within 1 mm accuracy. For the watermarks listed above, all have appeared with the "A" C/P combination (to be provided), except the 11 mm which was not accompanied by any seals. A member tells us that the second watermark shown above: "is a Doi watermark, square 10 mm size, which we understand as a Katakana DO (actually it is a "TO") within the box shaped i (Kanji). This seal is from an early Nou�t print, which shows a night scene of Kagurazaka. Almost an identical scene was later designed by Koitsu, only Koitsu had the characters "Doi" on the red lantern, where Nou�t shows the "Fuji" characters. The print seems to be prewar or early postwar with a Doi Hangaten seal." The diversity of Doi watermarks goes further still. Philip H. Roach, Jr. has recorded a copy of the 1932 Hasui print "Spring Snow at Kyoto Kiyomizu" having the Do watermark about midway down the left side, with no encompassing circle. His study of Doi prints extends beyond Tsuchiya Koitsu and Kawase Hasui, to include the artists Daiko, Shoho, Gyosai, Ishiwata Koitsu, and Toko.